Leading up to the July 6 release, Hyundai is tapping into Ant-Man’s superpowers with a fully integrated marketing plan that includes new commercials, an interactive sweepstakes and much more. Starting on June 11, Hyundai will air the new Ant-Man and The Wasp-inspired ad “Stoplight Standoff” on U.S. broadcasts. Two police officers and a Veloster driver exchange in a very awkward standoff at a stoplight, as they each think the other is suggesting a race. Little do they know, a tiny Veloster based on the vehicle featured in the movie is the cause of confusion and is burning rubber between their cars, showcasing the car’s cool and aggressive look. The new spot was shown for the first time globally at Hyundai’s display at the Busan Motor Show in South Korea on June 7. Additionally, Marvel fans will have a chance at an early screening, as Hyundai will be placing around Los Angeles tiny, ant-sized versions of the Veloster, which will serve as movie passes to an exclusive showing. Hyundai will drop clues on its Facebook, Instagram and Snapchat channels about the mini-car locations. Participants will also be encouraged to post about the scavenger hunt on their social channels, using#HyundaiVeloster. The scavenger hunt will take place in late June. 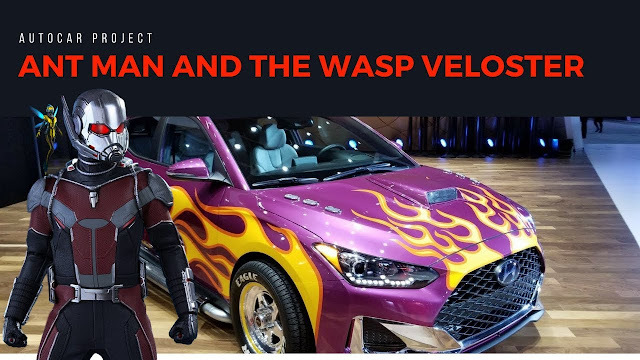 During the world premiere of Marvel Studios’ Ant-Man and The Wasp, the Veloster from the film will be dressed as a packaged toy car that has been enlarged and displayed at the red-carpet event. Hyundai will also be sponsoring the premiere livestream that runs on Marvel’s digital properties. During the livestream, two segments will be dedicated to Hyundai and hosted by Marvel’s on-air personalities as they explore more of the backstory behind Hyundai’s placement in the movie as well as fan reaction to what’s happening on the carpet. Marvel fans will have a chance at an early screening, as Hyundai will be placing around Los Angeles tiny, ant-sized versions of the Veloster, which will serve as movie passes to an exclusive showing. Hyundai will drop clues on its Facebook, Instagram and Snapchat channels about the mini-car locations. Participants will also be encouraged to post about the scavenger hunt on their social channels, using #HyundaiVeloster. The scavenger hunt will take place in late June. The screening will give attendees a special experience with Hyundai and Marvel, and a shareable night out at the movies. The event will have fun photo ops, gift bag giveaways, custom artwork posters and a Hyundai Veloster display. Roughly 500 people will be able to attend the exclusive screening, which takes place on July 3 in Los Angeles, three days before the theatrical release. Seating at the event will be first-come-first-serve for those that find a car. Advantage is helping manage the experiential screening event for Hyundai. Hyundai will also implement the movie car into the trim section area on HyundaiUSA.com’s Veloster landing page where guests can enter to win tickets to see Marvel Studios’ Ant-Man and The Wasp. Additionally, weekly mini-ads highlighting the Hyundai Veloster will be placed within Marvel comic books from June 20 to July 25. Multiple versions of this creative will subtly appear at the bottoms of various other advertisements that are promoting the biggest upcoming Marvel Comics releases. Finally, select Hyundai hand-raisers and owners will receive mail with custom artwork from Marvel artists of the Veloster that gives recipients exclusive early access to a behind-the-scenes featurette. The artwork will also be sent to all Hyundai dealerships to leverage in their showrooms.